The first day at a new job can sometimes feel like that dreadful first day of school. It is rife with potential for embarrassment, from not being able to find the bathroom, to losing important paperwork, to confusion about the rules (both explicit and unspoken). But, as bad as the first day at a new job is for new employees, it’s no picnic for managers either. There’s a lot for managers to cover – making new employees feel welcome, establishing their responsibilities, getting them oriented in their new position, acquainting them with the company culture – and the process can often be overwhelming. Most seasoned HR experts now know that employee onboarding is a vital component in both individual and organizational development and creates a foundation for future success. It also sets up the candidate for success. If you’re not convinced, consider this: U.S. and U.K. employees who do not fully understand their jobs cost businesses an estimated $37 billion every year, according to IDC. Their recently released white paper, “$37 billion: Counting the Cost of Employee Misunderstanding,” commissioned by international intelligent assessment company Cognisco, calculates the losses to be a result of “actions taken by employees who have misunderstood or misinterpreted — or were misinformed about or lack confidence in their understanding — of company policies, business processes, job function or a combination of the three.” Effective onboarding cuts these losses significantly by helping workers understand their roles and the company they work for. 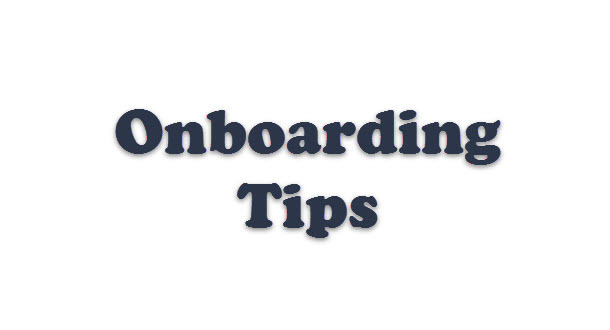 Here are 10 tips to live – and work – by for an effective onboarding experience. Provide the employee with a written plan of objectives and responsibilities. To reduce any confusion about a new employee’s job roles, provide a written plan detailing objectives, strategy and expectations of future results. Along with clearly describing the employee’s roles, it provides an opening to discuss concerns or new opportunities. Have relevant paperwork ready. Make sure all administrative forms, including employment, direct deposit, and benefits, are ready to be filled out on the first day so you don’t have to deal with it later. This will allow your employee to take care of these important matters right away. Give the employee your undivided attention. Letting yourself be distracted during orientation sessions by email, phone calls or other employees destroys moral by sending the message, “You’re just not that important”. Prepare a checklist of topics to review with your new employees. An appropriate amount of time should be set aside to go over the checklist, and other employees should be made aware that you are not to be interrupted during orientation of new workers. This sends a message to new employees that they are the most important item on your agenda. Introduce the employee to his/her coworkers. Along with providing staff members with the new employee’s résumé and job description, advise them to follow a meeting format which can include sharing a description of their own positions, interaction of their roles with those of the new employee, and ways in which they can work together in the future. This time can also be used to assign the new hire a mentor or buddy as a helpful guide and resource for any questions and key information about company culture and goals. Clearly describe the company culture. Provide the employee with company information, policies – including dress code and late policies – and benefits to avoid future confusion. Make sure a copy of your organization’s new employee handbook is on the desk as well. Provide balance. Because the first day is always difficult, include less formal gatherings between meetings to vary the schedule. Inject a bit of non-meeting relief and lightness by arranging for a group of staff members to treat the new hire to lunch on the first day. Be truthful with your employee. There are few things more disappointing than the realization that the job you believed you were hired for is vastly different than what you’re actually doing. Misrepresenting an employee’s new role immediately destroys trust in an employer, and no amount of redirection efforts can undo the initial harm. Set up the employee’s workstation. Giving a new employee an empty workstation is like showing a houseguest to a messy room. Stock the employee’s workstation with everything from paper and pens to keys and, if possible, business cards before he or she arrives on day one. Be sure to set up the phone and computer, including voicemail and e-mail accounts. Provide the new hire with a copy of an organizational chart, staff list, and phone directory on his or her desk. Schedule some one-on-one time. This will guarantee that you connect regularly with the new employee. If doing so on a weekly or bi-weekly basis is not feasible, meetings can be scheduled at 30- and 90-day checkpoints, or before a semi-annual review, to provide feedback. Think beyond the first few days. Request formal feedback after 90 days from the new hire’s supervisor on his or her performance. Request feedback from the employee as well. Address any issues of concern, and use the opportunity to note any accomplishments so that all those involved are confident that the new employee is poised for success in his or her role.